We advise you look through the artist portfolios and decide who you would like to work with for your new tattoo. You should come in to the studio to consult with the artist, and make an appointment. You should have a good idea of what you want before you come to the studio. While you are researching your tattoo idea, take some time and print some reference material for your artist. Even if you can only find examples of what you don’t like, it will help your artist see your vision more clearly. To make an appointment you must leave a $50 retainer. This holds your appointment and is deducted from the payment of your tattoo. A retainer is non-refundable. If you notify the studio within 72 hours of your appointment we can transfer the appointment to a different day. We do not make tattoo appointments over the phone: you must come in and leave a retainer in person. If you want to have an artist get started on a design for you but you are not sure of an appointment date, you can leave a drawing retainer. This retainer will hold your spot on the book after you approve the artwork. You are paying for the artists time to draw, and at no time is this retainer refundable. On the day of your appointment, we will hold your appointment for 15 minutes. After that, you lose your appointment spot, and your retainer. Getting a tattoo is not a fast process. You should eat something prior to your appointment. If you appear to be under the influence of drugs or alcohol we WILL decline to tattoo you. As there are so many factors that we need to know about in order to give you an accurate estimate, we do not quote prices over the Internet or telephone. 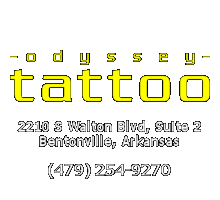 To get a price quote, you must come in to discuss the price of your tattoo with an artist. We do not charge for consultations, so it does not hurt to come in and speak with one. Custom tattooing costs according to the time involved. Larger and complex tattoos can cost thousands of dollars, while smaller and simpler things cost less. Our studio minimum is $50. No. We do not send requests to people over the Internet. If you are looking for a design online, we recommend deviantART. Tattoo Johnny and Tattoo Finder are also good resources for tattoo ideas. You can also go to Google or bing and click on “Images.” You will find hopefully thousands of designs to look through. If you still can’t find something, come in and see our digital flash library and speak with a tattooist. We love doing custom design work. If you need someone to help you with your own design, come in and meet with us! Yes, it can be anything you like, but it will need to be converted into a tattoo design. Some styles of artwork do not work well as a tattoo, but we use our experience to guide you with the selection of the artwork and style. We accept cash, ATM/Debit, Visa, Master Charge, and Discover. We do not accept personal checks. To some. Yes, that is intentionally vague. Pain is relative. However, the pain is an outside pain (irritation), not an inside one (tooth ache). Yes. Sun, improper healing, and poor health, will affect the final results. All tattoos age. How well they age depends on the size, and placement. Older tattoos can be redone and recolored. Unwanted tattoos can be covered with a new tattoo (cover up).